Feeling a little dull and sluggish this spring? Not quite like yourself, and perhaps lacking a certain degree of your usual self-confidence? Well, its time to ignite your inner fire and spark your shine before the summer is officially here! Your third chakra — your personal place of power, self esteem and expression — just needs a little kick start. Associated with the element of fire and the power of transformation, the third chakra is located around the area of the solar plexus (above the navel) and is considered the core of your personality. When your third chakra is weak, you often lack willpower, purpose and drive as well as confidence. The feeling of being “shut down” or running on autopilot is associated with a weak third chakra. Nobody has time for that! 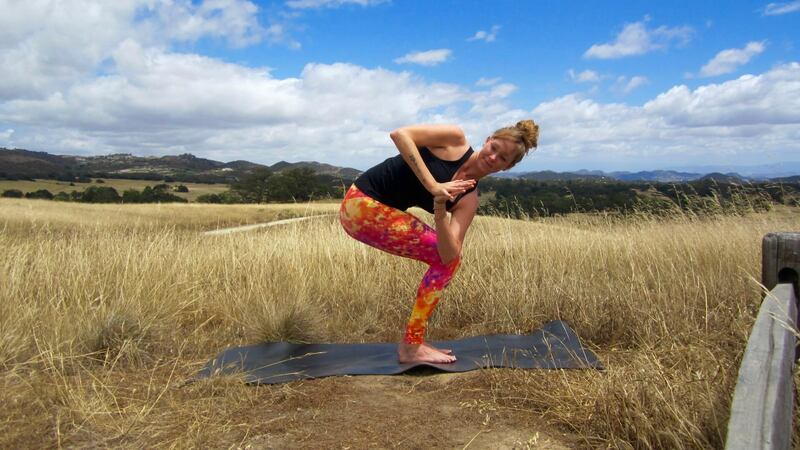 The following Chair Pose sequence was designed to create heat, boost circulation, burn off stagnation and ignite your inner fire — harnessing the warrior energy of your third chakra. With your feet together or inner hip distance apart, reach your inner thighs and sitting bones back to come into Chair Pose. Lightly lift through the low belly, drawing your low ribs in, and reach your arms overhead. Make sure there’s weight in your heels and if your knees are as wide as your feet. Now begin Breath of Fire (a continuous breath powered by abdominal contractions on the exhalation as the air is rhythmically pushed out and pulled in through the nose). Start by taking a deep inhalation, allowing the belly and ribs to softly expand, then sharply exhale, forcing all of the air out by pulling the naval in toward the spine. As soon as all of the air is pushed out immediately relax your abdomen pulling the air back in as you inhale. And then do the same sharp, forceful exhale, rhythmically pumping the air out and allowing it to fill back. The technique is a bit tricky at first, so start slow and begin to build a rhythm, quickening your pace as your more comfortable. If you're new to Breath of Fire, stop after ten rounds or when you need to. For those comfortable with the breathing exercise, try holding for 30 seconds to one minute. In Chair Pose, take an inhale as you stretch your arms up and on your exhale, bring your hands together and prayer twist right, hooking your left elbow outside of your right knee. Next inhale, reach your arms back up in Chair Pose and on your exhale, bring your hands together and prayer twist left, hooping your right elbow outside your left knee. Inhale and reach back up into Chair Pose; exhale and prayer twist right again. Continue to reach up on your inhales and twist on your exhales, pulsing from side to side, in and out of twists. Feel free to straighten your legs as you reach your arms up on the inhale, sitting back down into Chair Pose on your exhale to twist. Begin in Chair Pose with both palms facing forward. Take an inhale, and on your exhale, pull your elbows down to a square and lift your heels up. Inhale, straighten your arms and lower your heels. Continue lifting your heels and pulling down through the elbow on your exhales, and lowering the heels and lengthening the arms on your inhales — for five rounds of breath. 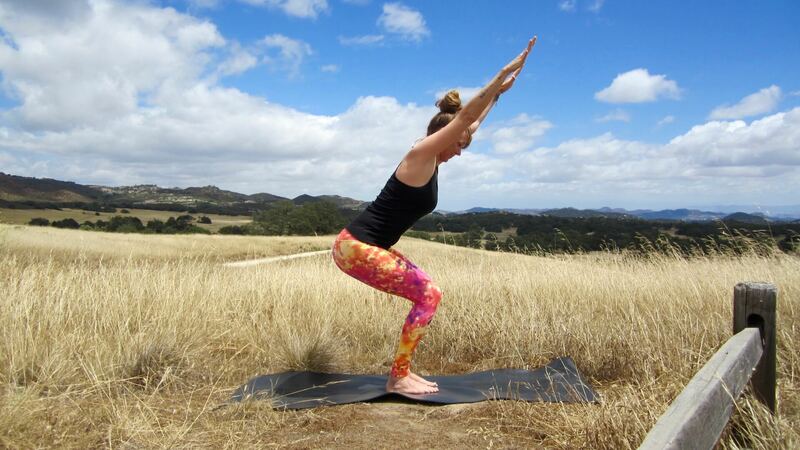 Then take a gentle, bent-knee forward fold, holding onto opposite elbows as you slowly let go and deepen your breath. This simple Chair pose sequence is doable for yogis of different practice levels, and can help light that spark to get your inner fire going. Give it a shot and let me know how it goes in the comments below!